The Via Francigena is an ancient road between Rome and Canterbury, passing through England, France, Switzerland and Italy. In mediaeval times it was an important road and pilgrimage route. To pilgrims headed south, it was the Via Romea; to those headed north, the Via Francigena. San Gimignano rises on a hill (334m high) dominating the Elsa Valley with its towers. It was once a small Etruscan village of the Hellenistic period (200-300 BC). It began its life as a town in the 10th century taking its name from the Holy Bishop of Modena, St. Gimignano, who is said to have saved the village from the barbarian hordes. The town increased in wealth and developed greatly during the Middle Ages thanks to the "Via Francigena" the trading and pilgrim's route that crossed it. Such prosperity led to the flourishing of works of art that adorn the churches and monasteries. In 1199 it became a free municipality and fought against the Bishops of Volterra and the surrounding municipalities. Due to internal power struggles it eventually divided into two factions one headed by the Ardinghelli family (Guelphs) and the other by the Salvucci family (Ghibellines). On the 8th May 1300 Dante Alighieri came to San Gimignano as the Ambassador of the Guelph League in Tuscany. In 1348 San Gimignano's population was drastically reduced by the Black Death Plague throwing the city into a serious crisis which eventually led to its submission to Florence in 1353. In the following centuries San Gimignano overcame its decline and isolation when its beauty and cultural importance together with its agricultural heritage were rediscovered. The construction of the towers dates back to the 11th and 13th centuries. The architecture of the city was influenced by Pisa, Siena and Florence. There are 14th century paintings of the Sienese School to be seen and 15th century paintings of the Florentine School. When Archbishop Sigeric was on his way back to Canterbury from Rome around the year 990, he passed through the Valdelsa and noted San Gimignano among the stops that he made. Following the route in the opposite direction from north to south, the road probably entered the current province of Siena near Montecarulli after having passed the Santa Maria a Chianni, a Parish Church, in the Gambassi Terme area. The route then conttinued to Santo Pietro, seat of a Romanesque church wlth a single nave, Pancole, now a 17th century sanctuary which stands in a place where there is a worshiped image of the Madonna, Collemucioli, with a high stone tower and stretches of pavement nearby, and Strada, a place name which is meaningful in itself, where we find a church with a nave and Romanesque apse dedicated to Saint Michael. The real foundation of Gambassi Terme occurred during the Etruscan and Roman Ages, when the first settlements were built close to important roads like the so called "Via Francigena". An official act dating back to 1037 testifies the presence of a castle in Gambassi Terme and quotes about a donation act of some lands to the Bishopes of Volterra, who, during the century, also got the possession of the castle of Gambassi Terme, holding it up to the XII-th century. At the end of the XII-th century a little "castrum" (fortified settlemen) rose close to the castle that later became a common with its own statutues. During the next century Gambassi Terme subdued the consequences of the existing rivalries between the Bishops of Volterra and the close village of San Gimignano, wanting this latter to take the control of the village away from the Bishop. The quarrels ended only in 1294 when the Republic of Florence conquered Gambassi Terme and annexed it to its countryside. In 1322 Gambassi Terme became a Florentine Podestà's seat, increasing, along the same century its economy by starting some manufacturing glass activities. Returning to Certaldo Basso and taking the the road for Gambassi Terme, which, after crossing over the river Elsa, climbs up in the beautiful hilly countryside, you arrive at the magnificent parish church of S. Maria a Chianni, a Romanesque church inspired to the style of Pisa, famous for its elevated presbytery. Gambassi has medievai origins, lt is now a famous center for glass and a thermal town using iodine-salt watet from Pilo, famous since ancient times. Continuing along the same road towvards montaione it is worth visiting San Vivaldo, a Franciscan convent built at the end of the 15th century in the wood of Boscolazzeroni. Here one can see the so-called 'Sacro monte', a series chapels which reproduce the topography of sacred sites of palestina. The original trinity chapels built at the be- ginning of the 16th centuty have now been reduced to twenty. They exhibit several groups oE polychromous tetracotta statues. A short stage, however an interesting one for the beauty of the landscape along the Via Francigena. Exiting from the centre of Gambassi Termi, one goes towards the Luiano farm, passing through terrain cultivated with vineyards. Once past the farm, we encounter the bridge of the Madonna, on the Torrente dei Casciani which marks the confine between the provinces of Florence and Siena and the entrance to the municipality of San Gimignano. From here the route goes uphill past cultivated fields and beautiful cypresses until reaching Pancole, the site of a Marian sanctuary and a place for refilling water. The route involves going through the underground passage of the large religious structure. Shortly after, one can already glimpse the multi-towered profile of San Gimignano. But before reaching the town we encounter the charming Romanesque parish church of S. Maria a Cellole, completed in 1238, as recorded in an inscription to the side of the portal. From the church, passing the houses of Sferracavalli, one can take a brief detour to visit an Etruscan necropolis with well-preserved hypogeous room tombs that date between the 4th and 1st century BC. There is no rest point along the route. Gambassi Terme is located about 35 km southwest of Florence. Main sights are the church of San Giovanni Battista, in the frazione of Varna, which houses a replica of Andrea del Sarto's Madonna with Child and Saints, the Romanesque Pieve of Santa Maria Assunta (12th century), and the Parco Comunale, former garden of the Villa Sinnai. The Gambassi garden is located between the historical centre and the facility of the Terme di Gambassi (Gambassi Hot Springs). In the past the park shaped the expansive garden of the Villa Sinnai, and still testifies to its elegance and richness. In 1916 the villa was acquired by the Piccoli family, which introduced some exotic plants imported from Africa into the park. Just outside the centre of Gambassi on the road towards Castelfiorentino stands the splendid Romanesque parish church of Santa Maria a Chianni, one of the most significant monuments of Romanesque architecture in the Elsa Valley. The first mention of the parish of Santa Maria a Chianni can be found in a document dated 26 March 988. The basilica design with a nave and two side aisles is grafted on a wide, protruding transept, on the end wall of which there were originally five semi-circular apses. Of particular interest are the four smaller apses made in the depth of the end wall itself, following a design which is also found in the Cathedral of Volterra. On the spot where the monastery would be built, in 1075 one found a chapel that was donated to the female monastery of Cavriglia. In 1224 the monastery was subjected to San Gimignano and in 1240 the Catignano nobility ceded their rights to San Vittore to San Gimignano. A presbytery was united to the female monastery. In fact, in the tithes of 1302-1303, it was nominated, among the exempt, the «canonica Sancti Victoris». In 1337 the nuns moved to the interior of the castle of San Gimignano, in the monastery of San Girolamo. The ruins of the complex of San Vittore are near the farmhouse of the same name, recently restored, and were the object of excavations which, although bringing to light many material finds (the church, a mill and other edifices), were very destructive from the historical point of view, because conducted without criteria of stratigraphic analysis, with the consequential loss of valuable historical indications. The Badia di San Pietro a Cerreto was donated to the abbot of Camaldoli Rustico together with the belongings of the neighbour Badia di Adelmo, where lived the 'Vallombrosano' monk Giovanni delle Celle, who died between 1370 and 1380. It was suppressed in 1652. On the façade there is the stone crest of the Camaldolesi Oder. Inside there are painted busts of Camaldolesi monks and a "Madonna and Child between the Saints Monaca and Augustin", painted by Francesco Soderini in 1726. This painting on wood was given by the Florentine galleries in change of the "Coronation of the Virgin" by Lorenzo Monaco, nowadays kept in the Uffizi, in Florence; it was painted for the Florentine monastery of Santa Maria degli Angeli in 1414 and then moved to the Badia di Cerreto probably at the end of the 16th century. The Parish Church of Santa Maria in Chianni was mentioned by Sigerico, archbishop of Canterbury, on his way back from Rome (990-994). The Romanesque building is from the 12th century. The façade has a double order of small arcades and in its upper part takes inspiration from the Pisan models although it differs from them in the decorations depth. The inside is divided into three naves parted by columns and covered, in the presbytery, by a projecting transept. The wall of the presbytery is measured by four apses, made from the walls depth, on the side of the main apse. The former presbytery was substituted by a quadrangular apse in the 16th century. Inside there are some interesting capitals. The Sanctuary at Pancole is located near San Gimignano. Its origins began by the year 1668 when the Virgin Mary appeared to a young deaf-mute girl named Bartolomea Ghini. She was cured and the Mother of God arranged for the provision of her poor family's basic necessities like flour, wine and oil. Thereafter she was venerated as the Mother of Divine Providence. In 1670 the Sanctuary was built. It was destroyed by the German Soldiers in 1944. It is rebuilt in 1949. At the center of the church is the miraculous frescoe painted by Pier Francesco Fiorentino in the 15th century which represents the Blessed Virgin breast feeding the Holy Child. Yhe Romanesque Parish Church (Pieve) of Cellole that was built sometime around 1190 and consecrated in 1237, as confirmed by the two original plaques. It is a lonely spot now, surrounded by a grove of typically Tuscan cypresses. The Pieve or Church is entirely in stone, with an impressive facade pierced by a mullioned window divided by an elegant little column". San Gimignano delle belle Torri' is in Tuscany, 56 km south of Florence. It served as an important relay point for pilgrims travelling to or from Rome on the Via Francigena. The patrician families who controlled the town built around 72 tower-houses (some as high as 50 m) as symbols of their wealth and power. Although only 14 have survived. The town grew around two principal squares, the Piazza della Cisterna and the Piazza del Duomo. The triangular Piazza della Cisterna is ornamented with a lovely well that stands in the centre. The piazza is bordered by tower houses: the twin towers of the Ardinghellis to the west, the tower of the Benuccis, the Casa Rodolfi and the Palazzo Razzi to the south, and the Palazzo dei Cortesi to the north. The Piazza del Duomo has more a intricate layout that took form in the late 13th century. The majority of public and private monuments are found here. On the west, is the Collegiata of Santa Maria Assunta. On the east is the former palace of the podestà (1239), which was transformed into an inn, then a theatre, and today is disused; the Torre della Rognosa and the Torre Chigi are also on this side. The Palazzo del Popolo stands on the south along with the Torre Grossa which rises to 54 m and faces the twin towers of the Salvucci on the north. The historic centre of San Gimignano contains a series of masterpieces of 14th- and 15th-century Italian art in their original architectural settings, including: in the cathedral, the fresco of the Last Judgment, Heaven and Hell by Taddeo di Bartolo (1393), the Martyrdom of S. Sebastian by Benozzo Gozzoli, and above all the magnificent frescoes by Domenico Ghirlandaio - the cycle of Santa Fina, the Annunciation in the St John baptistry. Other works of the same outstanding beauty include the huge frescoes by Benozzo Gozzoli depicting St Sebastian and St Augustine. The frescoes by Memmo di Filippuccio which the township commissioned in 1303 to decorate the chambers of the podestà in the Palazzo del Popolo are among the most frequently reproduced documents used to illustrates daily life, down to its most domestic details, of the early 14th century. The Collegiata is the main church of San Gimignano. Directly in front of the Duomo is the Palazzo Vecchio del Podestà, imposing and topped with a tower – the Rognosa. The initial construction dates back to the 12th century; it was rebuilt during the 1200s and then enlarged in the 1300s. The Torre Rognosa is well over 51 meters high and is a palazzo of 17 floors; it is second in height only to the Torre Grossa. The top floor of the tower is a belfry. In the era of the comune, bells had a fundamental role: they served not only to alert citizens in times of danger but also to remind them of public events like fairs and market days, as well as to mark the passing hours. It is no coincidence that it is also called the “Clock” Tower. The name “Rognosa” (Mangy), comes from the fact that after the podestà left, the palace became a prison, meaning that the place was inhabited by those who had "troubles” or problems. The Collegiata is the main church of San Gimignano. The Romanesque interior is famous for its lavish frescoes, which almost entirely cover the walls. The arcades are of black and white striped marble. In the centre is a large fresco of St Sebastian by Benozzo Gozzoli (1465), commissioned after the plague had hit the town in 1464. A fresco cycle by Taddeo di Bartolo depicts the Last Judgement in gruesome detail. There are also cycles of the Old Testament by Bartolo di Fredi (1356–1367) and the New Testament, traditionally attributed to Barna da Siena (who supposedly died in a fall from the scaffolding while painting them), but possibly by Lippo Memmi (begun in 1333). The two main chapels are the Cappella di San Gimignano, with an altar by Benedetto da Maiano, and the Cappella di Santa Fina, designed by Giuliano da Maiano, with the sculpture by his brother Benedetto. Domenico Ghirlandaio painted the frescoes in the latter chapel. St Fina was born in San Gimignano in 1238, contracted an incurable disease when she was ten and spent the five years until her death lying on a board to increase her suffering before God. On her death the board was covered in flowers. The house where she supposedly lived and died still stands in the town.Benozzo Gozzoli's (1420-1497) main works are three extensive cycles of frescoes. The cycle decorating the main apsidal chapel of the Church of San Francesco in Montefalco depicts episodes and deeds from the life of St Francis. The cyle depicting the Procesion of the Magi with decorative charm coupled with Flemish realism was executed on the walls of the private chapel of the Medicis' residence in Florence. The cycle of St Augustine is in the apsidal chapel of the church of Sant'Agostino in San Gimignano. The church of Sant'Agostino in San Gimignano is a single-aisled hall church with three apsidal chapels and an open roof truss. It was built by the Augustinian canons between 1280 and 1298, and it represents a typical example of the Gothic architecture of the mendicant orders in central Italy. In the apse of the 13th century church of Sant'Agostino are seventeen frescoes, which illustrate the life of the great theologian, St Augustine of Hippo. They were painted by one of the masters of the Florentine Renaissance, Benozzo Gozzoli. Gozzoli paints the life of the saint with his usual flair for intimate and personal details. Benozzo was given the commission by Fra Domenico Strambi, a learned Augustinian monk belonging to the monastery who in 1449 had been given a grant by the town to study theology at the Sorbonne in Paris. The paintings were produced within the contemporary context of the reformation of the monastery of Sant'Agostino. The intention was to merge it with the Augustinian order of San Salvatore in Lecceto near Siena. The choir, being the place where the community of monks assembled, was decorated with a didactic program of the life and work of St Augustine. The cycle of St Augustine is one of the main works of Tuscan narrative art dating from the middle of the century. It can take its place alongside the fresco cycle of the Legend of the True Cross (1453/54) by Piero della Francesca in Arezzo and Donatello's Passion Pulpit and Resurrection Pulpit (1460-62) in San Lorenzo in Florence. Benozzo Gozzoli, in collaboration with several assistants, produced here his main work, the decorations of the apsidal chapel of the church in 1464-65. As in Montefalco, the life of St Augustine is narrated as an ascent: the lowest register depicts the education, teachings and travels, the middle one his path to faith, and the lunettes the culmination of his journey through life. The vault symbolizes his ascent to heaven. The lavish framing of the picture fields by means of narrow gold borders and painted pilasters is an innovation in this form. The cycle depicts 17 scenes from the life of St Augustine. The pictures, which are arranged in three rows, use the traditional horizontal direction of reading, from the bottom left to the top right. The vaulting shows the four Evangelists on concentrically painted clouds, creating the impression of a circular vault. Memmo di Filippuccio was an Italian painter and illuminator. He was the son of the goldsmith Filippuccio (active 1273-1293). In 1948 Longhi attributed a fresco of the Virgin and Child Enthroned with Sts James and John the Evangelist in the church of San Jacopo, San Gimignano, and others in the tower of the Palazzo del Popolo there to Memmo, who is documented as having lived and worked in the town from 1303 to 1317. A document of 1303 also records him as having worked in the upper church of San Francesco, Assisi, and Longhi suggested this might have been on the frescoes of the St Francis cycle, which would account for the Giottesque influence he had noted in the frescoes in San Gimignano. Further attributed to Memmo are the frescoes of Carlo d'Angio Administering Justice (1292; San Gimignano, Palazzo del Popolo, Sala dell'Udienza), an altarpiece of the Virgin and Child Enthroned with Saints (Oristano, Palazzo Arcispedale), which also shows the influence of Giotto's work at Assisi, a Virgin and Child (Pisa, San Francesco) and a polyptych of the Virgin and Child Enthroned with Saints, formerly in the convent of S Chiara, San Gimignano (San Gimignano, Pinacoteca Civica). Memmo is also documented in 1305 as having worked in the Collegiata Pieve, San Gimignano, and it has been suggested that the lunette of the Virgin with Saints on the inside of the entrance wall and frescoes of the Annunciation and the Virgin and Child Enthroned with Sts Catherine of Alexandria and Mary Magdalene in San Pietro, San Gimignano, should also be attributed to him; and that given their fluid, gentle style these should be dated before 1321, when Memmo was recorded in Siena. The road books, the maps, the Google Earth and the GPS trails for the walk route of the Via Francigena. A practical and utile guidebook for the numerous Europeans who choose to experience Europe following the route and discovering the paths that make up the historical stages. Reasoned list of useful cultural and tourist links on the ancient faith ways. Way from the Grand St-Bernard to Rome. Paul Chinn and Babette Gallard, The Lightfoot Guide to the Via Francigena, Pilgrimage Publications, 2009. In 3 volumes, Canterbury to Besançon; Besançon to Vercelli; and Vercelli to Rome. Available through our Bookshop. Mainly inteneded for cyclists, but it gives good route-finding information with GPS references and details of accommodation and services. The best guide book to the Via Francigena in Italy is written in Italian. Guida alla Via Francigena: 900 chilometri a piedi sulle strade del pellegrinaggio verso Roma, by Monica d'Atti and Franco Cinti. (Supplemento al numero 132, aprile 2006, di "Terra di Mezzo." Piazza Napoli 30/6, 20146 Milano.) ISBN: 88-8938-565-0. Concise route description of the section from the Great Saint Bernard Pass to Rome, with details of acommodation and services. Its maps are incredibly detailed, there are many photos and much information can extracted even if you can't read Italian. La Via Francigena Guida per il pellegrinaggio a piedi dal Gran San Bernado a Roma, Luciano Pisoni & Aldo Galli, ADLE Edizioni, Padova, 2004. ISBN: 88-8401-046-2. Guide to the Italian section of the route comprising a book and 28 laminated A4 size maps, with walking instructions and accommodation details on the back of each one. Monica D’Atti & Franco Cinti, La Via Francigena. Cartografia e GPS. Dal Monginevro a Roma lungo l’itinerario storico, Milan: Terre di Mezzo Editore, 2007. ISBN: 978-88-8985-60-9, 22€. 3 large sheets of maps in a set, covering the 800km from the Monginevro Pass over the Alps to Rome at a scale of 1:30.000, i.e. nearly two and a half inches to the mile. In full colour there are 40 detailed maps covering all the stages of the journey, with the walkers’ route traced on them, height profiles, types of roads/paths used and complete GPS data. Designed initially to accompany the authors’ own guide book (see above) the only drawback (at present) is that those wishing to follow the “Sigeric route” (i.e. cross the Alps via the Great St. Bernard Pass) will have to wait till Vercelli (150km into the Italian part of the route) before they can use them. TOPOFRANCIGENA dal Gran San Bernardo a Roma (900km) was published in 2005. The Topofrancigena is a set of maps (again in two parts Canterbury to St Bernard Pass published - Italian 2005) of the route. The Canterbury to St Bernard Pass section consists of 40 pages in full colour, with alternative routes, very loosely bound so old pages can be discarded. The maps show town or villages with accommodation and churches and historic sights. Podere Santa Pia is immersed in the utmost quietness where total privacy is guaranteed, in a scenic location 50 minutes away from both the sea and the Val d'Orcia National Park. For those wanting to get away and relax in idyllic countryside and lovely gardens yet be just a short drive from some one of Tuscany's most intoxicating cities, Santa Pia is the perfect choice. Abbadia d’Ombrone and Monastero d’Ombrone near Castelnuovo Berardenga. Podere Santa Pia is located in south of the ‘Crete Senesi’, a beautiful clay hills landscape which is an ideal starting point to discover Tuscany. The guesthouse is located in Castiglioncello Bandini, a charming medieval village situated on a hill, which offers a spectacular view on the Valle dell’Ombrone and the Maremma. 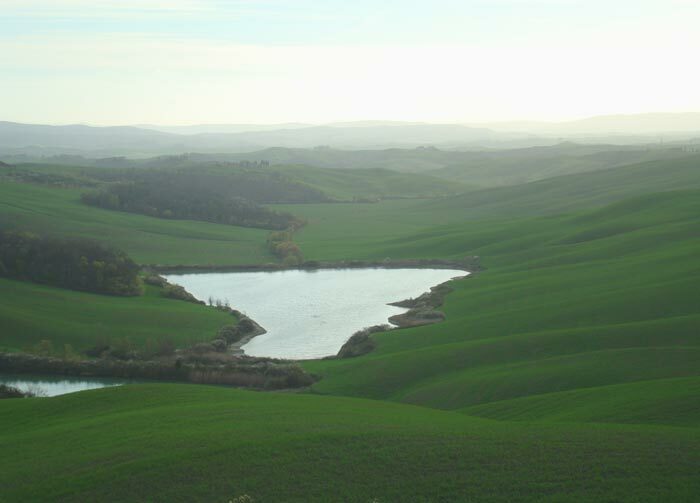 Montalcino, the abbey of Sant'Antimo, Pienza and the Crete Senesi with Asciano, Buenvonvento and the Abbey Di Monte Oliveto Maggiore are within easy reach. With its gothic influences, Siena is often called the most beautiful city of Tuscany. This medieval city amidst the olive yards and the Chianti, consists of narrow streets and small squares. The city contains Toscana’s most photographed place, the “Piazza del Campo”. Twice a year, this square is the venue for the colourful “Palio”, a horserace wherein each ‘fantino’ (participant) competes for the honour of its ‘contrada’ (quarter). The Abbey of Monte Oliveto Maggiore, a large Benedictine monastery, is located 36 km south of Sienna and 10 km south of Asciano, in the characteristic "badlands" landscape of the Crete Senesi. The Olivetan community traces its foundation to 1313. The monastery is accessed through a drawbridge which leads to a medieval palace in red brickwork, surmounted by a massive quadrangular tower with barbicans and merlons. The Chiostro Grande ("Great Cloister") has a rectangular plan and was realized between 1426 and 1443. On the oldest side it has a two-storey loggia and a pit, dating to 1439. Under the vaults of the cloister are frescoes of the Life of St. Benedict painted by Luca Signorelli and il Sodoma, considered amongst the most important Renaissance artworks in Italy. The frescoes disposition follows St. Gregory's account of Benedict's life. Signorelli's paintings were executed in 1497-98, while Sodoma's date to 1505 afterwards. The church entrance is preceded, in the Chiostro Grande, by a frescoes with Jesus Carrying the Cross, Jesus at the Column and St. Benedict Giving the Rule to the Founders of Monte Oliveto, also by Sodoma.